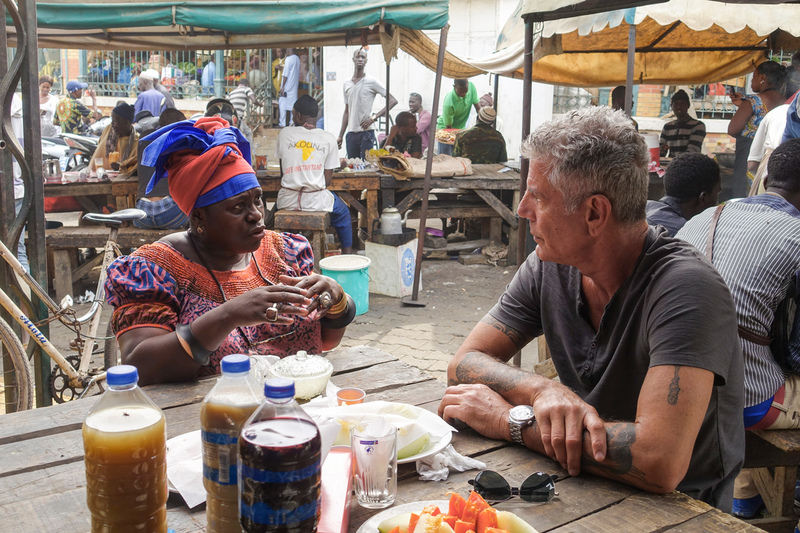 Remembering Anthony Bourdain's Breakfast In Senegal With NPR's Ofeibea Quist-Arcton : Goats and Soda The chef and television host has died at age 61. NPR's West Africa correspondent Ofeibea Quist-Arcton remembers her meal with him in the open-air market of Senegal, filmed for his TV show. In 2016, NPR correspondent Ofeibea Quist-Arcton shared breakfast with Anthony Bourdain at Marché Kermel in Dakar, Senegal. Anthony Bourdain and Ofeibea Quist-Arcton had breakfast at Marche Kermel — a popular market in the heart of Dakar selling fruits, vegetables, herbs, seafood and meat. He was clearly impressed with the food, Quist-Arcton recalls: "He loved the Senegalese fruit juices and the lakh we ate. But he seemed even more interested in eating and drinking in the history, the culture, the people, everything about Senegal — and especially its harmony and tolerance." He described the country as "enchanting." And he noted that Senegal has managed to avoid the coups, civil wars and dictatorships that have blighted many of its neighbors. And that even though Senegal is a majority Muslim nation, its people elected a Catholic as its first president after independence from France in 1960. He said Senegal is one of those places that "leads you to believe maybe there is hope in the world." "I liked his curiosity, his openness, his passion, his compassion, his interest and his intellect," says Quist-Arcton. "He seemed to love people — and good food." We asked her about the meal — and her impressions of Bourdain. Did Bourdain seem like an international TV star? Anthony Bourdain has traveled all over the world, but he didn't visibly wear that jet-setting "globe-trotter" hat. There was a modesty there, and a will to learn. Right from the minute he sat down and we started chatting, you could feel that. He does seem very intense. I didn't meet him for very long. An hour or two. He is pretty intense, I guess, but positively intense. When he flashed that smile, he seemed just like anyone else you might know. And he was a jolly good listener. I got the impression that he's passionate about people and that shines through the intensity. He wants to learn everything about a country he's exploring! I have the impression that he's fascinated by people and by food and by culture. And politics! He feels like food gets to the heart of a culture. He did say he's traveled around Africa and the world, but he's never been to a country quite like Senegal. I can quite understand why he's captivated. I am too! One of the foods you ate with him was lakh — what is that? It's a breakfast or even an evening dish. It's like a yogurt with millet and a bit of vanilla essence and orange essence. This one had raisins. It's eaten especially during ceremonies — marriages, naming ceremonies, baptisms, christenings, funerals. It's delicious, creamy and rich, so it's like a meal! There were some bottles of liquid on the outdoor table where you and Bourdain ate — are those the fruit juices that Bourdain sampled? The Senegalese make juice from just about every fruit you find — the baobab [bouye], the tamarind [tamarin], red sorrel [bissap], mango, pineapple, ditakh. Their juices are totally delicious. We had ginger (the Senegalese call it by the English name, pronounced jinjehrrr) baobab and bissap that morning. Any other impressions of Bourdain you can share?